Sri Prahlad Chandra Brahmachari was born in the remote village of Purushottampur in Orrisa province of India. The family was very poor and had to endure much hardship. In his boyhood he had to go out and beg, not just for himself but for the whole family. In his teens the young Prahlad was sent by his father to work at the house of a wealthy man as a servant. It was some distance from home. At that place one day he was walking along the river with the children of the house. Some sweets were with them. Prahlad gave sweets to the children and ate some himself. The woman of the house saw this incident and reported it to her husband, who then gave Prahlad a severe beating. In despair he ran away from that place, traveling (without ticket) to the station at Waltair where the ticket taker found him and threw him off the train. After a while of begging for food in that town a kindly person told him he would do much better if he went up the nearby mountain where he would find lots of fruit trees growing. And since it was a place of many sadhus, or holy men, he could collect wood for them for their sacred fire ceremonies and they would share their food with him. It was a holy place near a temple of Nri Singha, the god who was half man, half lion. Baba said: "You have to climb up the stones one by one. It was very treacherous. If you fell down from there it was certain death. With great struggle I went up and I saw a flat land. There were many fruit trees and an image of Nrisingha. I had darshan." Baba stayed in the forest near the temple of Nri Singha. Coincidentally, it was at this place in olden times where a boy saint, also named "Prahlad," had done austerities for the realization of God. One night there in the deep jungle he had an encounter with a mysterious personage whom he ever after referred to simply as "my guru." He had awakened in the night with a terrible nightmare that his parents had died and he had not been able to be there. He believed the dream to be the reality and was crying and sobbing in sorrow and despair. Then the man appeared out of the jungle. He described the man as being huge, a giant of a man, incredibly tall and wearing nothing but a loincloth and a bag over his shoulder in the manner of a sadhu. The man asked Prahlad "Why are you crying?" 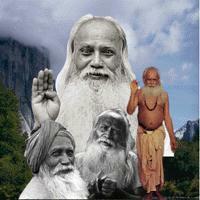 Prahlad replied "Because my mother and father have died and I could not be with them before they died." "There was an ordinary bag on his shoulder. From that bag he gave me 25 rupees. To me it seemed that I gotten a great amount of wealth! I was very poor. I had never gotten any money. Twenty-five rupees! Hari Baba! Getting that money I felt like a rich man. "Then suddenly he stopped and turned around... his image... it is beyond description! I cannot describe him in words. He came running back and got some leaves from the forest. And pulling out my tongue, he pressed the leaves and cut my tongue down the middle. "Then when he put the juice into the cut, as soon as he gave the juice it felt as sweet as honey. If there is such honey in God's world I have never found it. Getting that sweet honey my hairs stood on end. What peace my body received! "Then that great man put his hand on my head and said: 'Through you a great work will be done. Go. Go back to your place. A lot of work will be done through you.' He did not give me any mantra. No mantras, only that juice on the tongue." I have never heard of such an incredible initiation into the mysteries. The sadhu searching the woods for some particular plant leaves, making a juice, then taking the sharp thorny stem of some leaf, pulling out the tongue and making a cut about two inches long. The scar would be there for the rest of his life. I have seen it. And then into the cut on the tongue, the juice. Instantly, Baba later would say, everything was transformed by the juice on the tongue. He saw Guru and he saw God. He said it was sweeter than the sweetest honey. To this day we do not know what plant it was. Was it the possibly fabled "soma" medicine the Rishis sang of in the ancient Vedas? Was it a psychotropic substance, as it would seem from Baba's description?